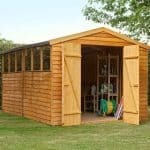 The Hartwood 10′ x 8′ FSC Overlap Apex Workshop is a good sized workshop that has just a ton of personality and will certainly be a stand out feature in any garden. This workshop offers you plenty of space so that you can fit in a couple of work benches, tools and other items you need to have some fun working on some projects. Also this is something that would work wonderfully well as a general storage shed, as it does offer you so much storage space. Four fixed windows are on one side of the shed so you can always count on plenty of natural light being in the shed during the day. Large double doors have been used so that getting your items into the shed, even larger ones is going to be easy. Even though this is priced at under £500, impressive materials have still been used in the construction of the workshop. While on their own the frame and that amazing, rustic looking overlap cladding are both great, combined they work together and are connected so well that they make the workshop a truly robust structure that is not going to still be standing strong 20 plus years from the day it is installed. The good sized, Hartwood 10′ x 8′ FSC Overlap Apex Workshop, is a shed/workshop that really did impress us. This is offering you plenty of space, so much space that you really could use this as a place to tackle some DIY or art projects. At the same time the space it offers is large enough that this would make for one very spacious storage shed. Speaking of space, the width is 8 feet 7 inches and the depth a very vast 10 feet 2 inches. 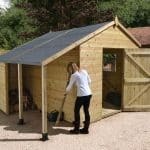 The height of the shed sees the eaves at 5 feet 6 inches which would be ideal for having storage shelves, benches or other similar things. The ridge height is a solid 7 feet high meaning you have plenty of headroom as you are walking around. So that rain does not get in and wreck your items or those awesome DIY projects you are working on, a solid sheet comprised apex roof has been used. Keeping the rain off the roof and from running down the front of the shed is something we always like to see. Covering the boarding is this very nice looking roofing felt that can really take a beating from the weather and not be any worse for it. At 8 mm thick, the rustic looking overlap cladding gives this a real, get your hands dirty and make some epic stuff kind of look. We just love how the cladding really does give the workshop just a ton of personality, but as well as this from a practical point of view. The really have done a great job in making sure the cladding is strong and able to easily keep out water. The most surprising aspect of the shed was the frame. We will admit that we totally expected to see a 28 mm x 28 mm frame in here, but they have gone that extra step by using a 46 mm x 28 mm frame. 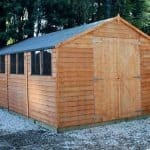 We know that some of your right now will be saying “who cares”, but the frame is a vital important part to a shed or workshop and this one with how sturdy it is and how it is securely attached to the cladding makes this one very robust and long lasting building. While we would really like to see some tongue and groove boarding in here as this is supposed to be a workshop after all, we understand the budgetary reasons as to why they have used solid sheet boarding for the floor. We do not mean to rag on solid sheet boarding at all, as this is still very strong and able to take a lot of weight. It is perfectly practical, it is just not as easy on the eyes as tongue and groove boarding. The Hartwood 10′ x 8′ FSC Overlap Apex Workshop will require annual treatment in order to protect the wood from rot. Also you will want to make sure that you give it its first coating within a week or two of installation. Treating the wood will keep it looking sharp and free from rot. As long as you keep the workshop well maintained and treat it on a regular basis, then they will happily give you a ten year anti rot guarantee. ‘Z’ braced double doors have been used which give the doors a real workshop type of feel. It makes them very robust and along with the hinges that they have used, the doors will stay exactly where they are supposed to and not sag or fall out of position in the future. 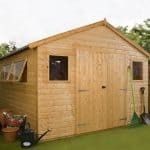 As you have so much space to get in and out of here, you can bring larger items into the shed with ease. One side of the shed has four fixed windows that are made with shatterproof styrene which is 1.2 mm thick. We like these windows and feel that the material used to make them, the size and their positioning is great. However as this is made to be a workshop, chances are you will be getting all sweaty working in here, so we do wish that they had made at least one of these windows be an opening window. Keeping the doors closed is a very nice looking silver coloured pad bolt. We are sure that you are going to be either making some multi million pound art or DIY projects in here, so you will probably want a good lock on the door. Well they do actually offer a high quality Yale hasp and padlock set, for £19.99. While there are four windows on one side of the shed, you could always position the shed so that they are not facing where people can easily look inside. Also adding something like fabric or if you want to be a bit more classy then blinds would be easy and relatively cheap to do. Before you buy the first tub of wood treatment that you see, we suggest that you have a think about changing the colour of the workshop. There are many different wood treatment colours out there, so get a little wild, have some fun and consider having the workshop be a more bright and vibrant colour. Or if you are a bit more on the old school side, a dark brown wood treatment would be pretty great. The hasp and padlock is not the only extra that is offered with this amazing workshop. They also have a plastic shed base that is designed to help give the floor a bit more support. This though does cost £199.99, so while a practical extra it is also a very expensive one that really, truth be told, is not essential for most people. While we feel that installing the workshop on grass would be fine, if this does concern you then do have a think about this shed base. This is one very well designed shed and while the flooring may not be as impressive as the rest of the shed, we are willing to overlook that as the rest of it is so very well made. 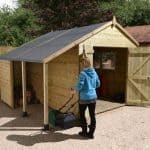 This is a shed that if you look after it right, treat it once a year and do not just abuse it, it will give you many years of use. It is not unrealistic at all to suggest that you will get well over 20 years of use out of this workshop. This is a workshop that offers plenty of space and to be honest it is not overly large either. You can really fit a whole lot of stuff inside here and we are sure that many of you will be surprised at how vast the storage space this offers is. We feel that the large and long roof will be the trickiest part of the installation, but apart from that this should not cause you any problems. Just be sure to have someone there to help you who is handy with a hammer and not shy about making the odd cup of coffee either. At under £500, this is excellent value for money. Sure a couple of things may not be super high quality, but for the most part they really have made this very well and you are getting a lot of value for your money. Final Thoughts: At 10 x 8, the Hartwood 10' x 8' FSC Overlap Apex Workshop is offering you plenty of room to have a few benches, worktops, an easel and anything else you may need to get some DIY or art projects done. 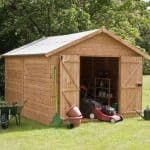 While this is being sold as a workshop, we must say that the space it offers does make this a great storage shed also. 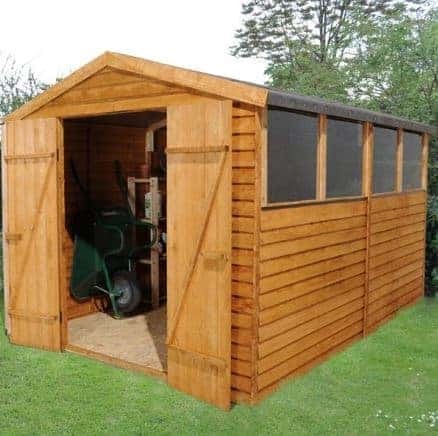 We really like this, and for under £500, you are getting a good sized and very well made workshop/shed that is going to last you many years. If you want to get as much space as possible for your money then we highly suggest you have a closer look at this.